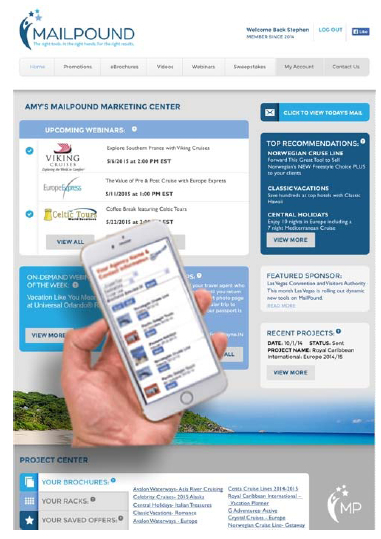 MailPound promises…to connect the travel industry by providing you, the travel agent, with no-cost educational tools and branded marketing resources to put suppliers’ offers in the hands your clients. One of the best options to keep you informed of the most up to date offers is subscribing to receive MailPound email broadcasts. From the information in your profile, you can not only choose what you receive from us, but suppliers are able to reach out to you with offers specific to your affiliation, location and specialties. Right from the broadcast, you can access a “consumer friendly” version, meaning the supplier contact information, links to the supplier website and commission information is automatically removed. Then, with just a click, your unique branding and personal message is automatically added! 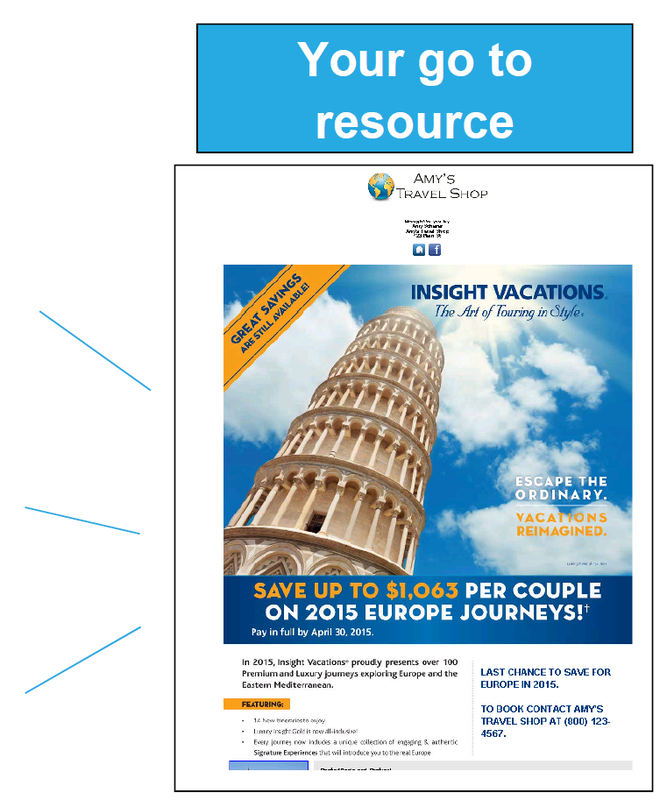 Seamlessly share it on social media or directly to your clients via email. Our “Today’s Mail” broadcast offers you another opportunity to keep up to date with the most current offers. Each morning, as you enjoy your coffee, you can review the latest offers available on MailPound with our daily summary, Today’s Mail. Each one offers a “consumer friendly” version, so right from this email, the offer can be forwarded or shared on social media! 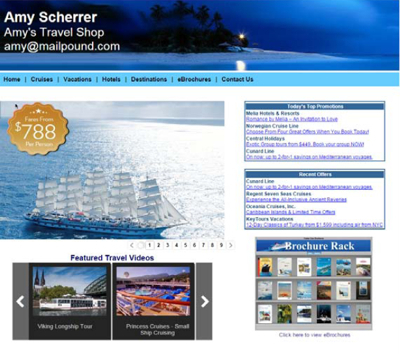 MailPound is the go to place for busy travel professionals. You can easily find what your client is looking for by using our powerful search engine. Search by category, destination, and supplier to get the results you need quick! When you need to get a brochure to a client, you can quickly search MailPound's inventory of eBrochures by supplier name, destination or type of product. 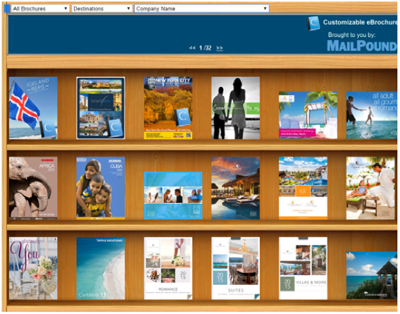 Right at your fingertips, you have access to over 750 supplier eBrochures on MailPound.com! Instantly you can view and share supplier brochures that are branded with your agency logo and contact information via email or social media. So no more “ordering brochures” and making clients wait! 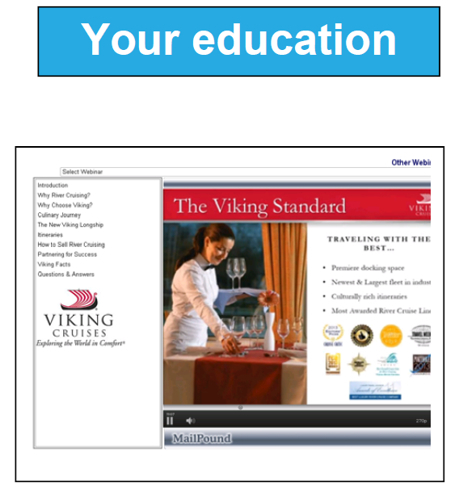 And, if a supplier has offers on MailPound, you can include the promotions within the eBrochure they send! 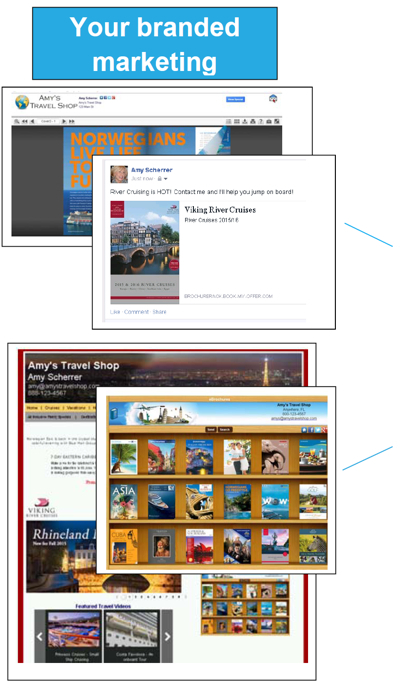 Would you like to feature up to date relevant content to on your website? MailPound makes that possible! With Virtual Brochure Rack and its interactive search feature, the consumer can conveniently find supplier eBrochures right on your website! They may search by company name, type of travel or the destinations they are interested in! Then, with just a click of their mouse, your client can share any eBrochure via email or on social media with friends and family all while keeping the you as the point of contact! With MailPound you can have your own Personal Agent Website. It will include a dynamic search capability so your clients can find the eBrochure and current offer they are looking for! Most importantly, each promotion and eBrochure automatically includes your agency logo, social media networks and contact information. Let MailPound take care of keeping your content current so you can focus on your clients! For a limited time we are offering a free month trial for professional travel agents and if you love it (which we know you will) you can continue for just $9.95 per month! This exciting feature enables you to attend live presentations with your favorite suppliers all without leaving the comfort of your agency or home office! In addition, MailPound will record each webinar and host it on MailPound.com for on demand viewing. You can listen to the presentation in its entirety or easily jump to the section that you are interested in for easy reference.